On November 7-9, 2018, the Kentucky Recreation and Park Society (KRPS) had their 65th Anniversary Conference held at Lake Barkely State Resort Park. EKU’s Department of Recreation and Park Administration (RPA) had two very special award winners. 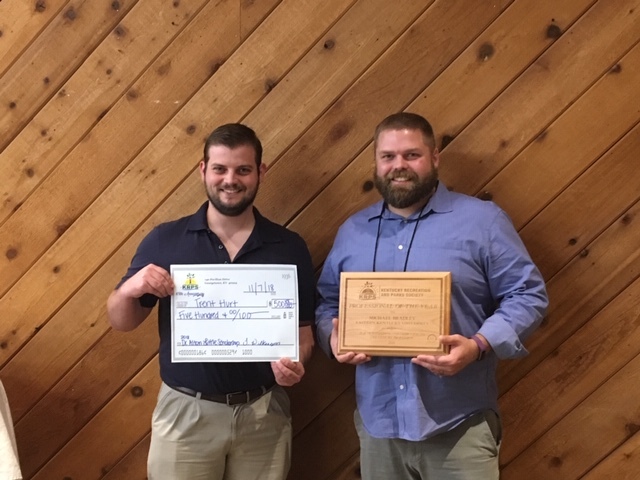 Dr. Michael Bradley was honored with the KRPS Professional of the Year Award and Graduate student Trent Hurt received the Dr. Alton Little Scholarship. Congratulations and well deserved Dr. Bradley and Trent!! Dr. Alton Little Scholarship– Recognizing a deserving college student majoring in the parks and recreation field. Presented by Dr. Alton Little. Professional of the Year– Recognizing a practicing recreation professional for outstanding contribution to the profession.